Thirteen-year-old Butterball doesn’t have much going for him. He’s teased mercilessly about his weight. He hates the Long Island suburb his mom moved them to and wishes he still lived with his dad in the city. And now he’s stuck talking to a totally out-of-touch therapist named Liz. Liz tries to uncover what happened that day on the playground—a day that landed one kid in the hospital and Butterball in detention. Butterball refuses to let her in on the truth, and while he evades her questions, he takes readers on a journey through the moments that made him into the playground bully he is today. This devastating yet ultimately redemptive story is told in voice-driven prose and accented with drawings and photographs, making it a natural successor to The Absolutely True Diary of a Part-Time Indian. Loosely inspired by 50 Cent’s own adolescence, and written with his fourteen-year-old son in mind, Playground is sure to captivate wide attention— and spark intense discussion. "Listen, lady, I'm sure you mean well, but let's you and me get one thing straight right now. I'm here because if I get expelled from school, I'll have to sit around my mom's apartment all day, and if I have to sit around my mom's apartment all day, I'll go even crazier than I am already, know what I', saying? So I'll sit here with you, but only if you ease off." "That's perfectly all right, But--"
"What, are you deaf or something? Didn't you hear me say don't call me that like ten times already? I go by Butterball, all right? Bu-tter-ball," I sounded it out. "It's not that hard." Maurice rose from the bench, and now his expression was definitely frightened. He put down his book and took a few steps toward me, and that's when I gave it to him. I reached into my pocket and BAM! I whacked Maurice right across that self-satisfied grin of his, and I pounded those batteries into his teeth over and over until I felt something come loose. When I pulled my hand away from his face for the last time, I suddenly became aware of how the whole scene had gone completely silent all around us: how all of those kids just stood there staring at me like I was finally something. And I'd be lying if I said that didn't feel pretty damn good. When I first heard that 50 Cent wrote a book I was utterly baffled. I mean, seriously? 50 Cent? Writing Young Adult books? It was like trying to imagine Snoop Dog singing in opera, the idea was ridiculous. I'm not a fan of 50 Cent, I don't think I ever listened to any of his songs.. I admit, I don't know much about him as a person, either. It's just that.. he never really struck me as the writing type (if you know what I mean). I just couldn't wrap my mind around it. But at the same time, I was insanely curious about this book! Who wouldn't be? The best part? I really enjoyed reading it! Believable, funny, insightful - Playground made a very positive impression on me. Color me surprised! 13-year-old Butterball doesn't have an easy life. After his parents divorced and his mom moved them away from Bronx to Garden City, Butterball finds himself struggling to adapt to the new environment. Back in Bronx he was someone, he had a group of friends and he was respected by others. Here, he's just the fat, black kid. He lives with his mother, but she's too busy working to spend quality time with him. His father doesn't care much about him, either. He's way too busy pursuing meaningless, purely physical "relationships" to ever pay attention to his son. Butterball is all on his own. Then one day he gets in trouble for assaulting a kid with a sock full of batteries, a kid that used to be Butterball's only friend there. After that, he's forced to attend weekly sessions with a psychologist. Butterball's initial attitude of "I-don't-want-to-talk-about-it" and "you-would-never-understand" begins to change over time, as the psychologist's patient and non-judgmental approach slowly wins his trust. As the story progresses, we learn more about the main character and the motives behind his actions. After all, there's no smoke without fire, and there's definitely more to Butterball than meets the eye. 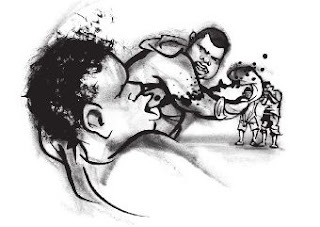 Playground is a book about bullying, yes, but not a typical one at all. From my experience, most of the bullying-related books out there are focused solely on the victims and their accounts of the accidents. Playground, however, offers something different - the bully's side of the story. Now you ought to know that I went into reading this book with curiosity but also a healthy dose of skepticism. I was afraid that it will turn out to be a major failure. I was prepared to toss it away after the first 20 pages or so. But it never happened. I loved Butterball's believable and often hilarious voice. It was vibrant, full of life and dripping with all sorts of emotions. He turned out to be a great character to read about. Slang, swear words, short sentences and simple vocabulary - all that helped to depict him. I enjoyed seeing the world through his eyes and, believe it or not, I really felt sorry for him at times. Imagine my surprise, when I hit the back cover without even realizing that I was reading for the whole day - without a single break! Now I don't know if 50 Cent hired a ghostwriter to do all the hard work, and it really doesn't matter. All I know is this book is damn good! It's deeper than I ever expected. It offers a fresh new take on the issue of bullying, one that I found quite thought-provoking and eye-opening. The writing itself is pretty good, too. The characters are well-drawn. The plot is simple, but well thought-out and fast-paced. It's an easy, quick read, but also quite a meaningful one. Don't let your prejudices stop you from reading it, it's definitely worth picking up! All you need to do to enter is be a GFC follower and enter through the Rafflecopter below! Wow... I didn't know he wrote, to be honest. But it seems like a really interesting read. Thanks for the giveaway! I suppose if he could write songs then he can write a book, and I appreciate the idea for this novel. I definitely want to give it a try. Thanks for the chance to win! 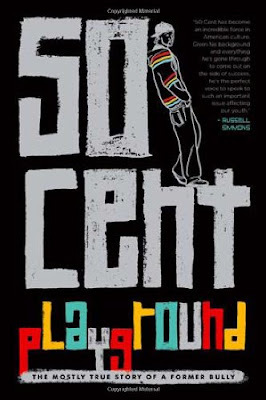 Wow, I'm actually a fan of 50 Cent, and I had no idea he'd written a book. It's interesting that the story takes place from the bully's point of view. Definitely piqued my interest! I believe my initial reaction was the same as yours. lol I had absolutely no idea 50 Cent wrote a book! I'm not a fan of his music so I don't follow him closely but the book doesn't seem bad at all. I might give it a chance. Anyways, thank you for the giveaway and I really enjoyed your review! Matt, I had no idea you're a fan of 50 Cent! I knew about Eminem, but not 50 Cent! :) You should definitely read it then, you'll see the guy in a totally different light! You should put the above review on Amazon where more people can see it and appreciate your analytical writing style. @Patricia - I am a sucker for pretty covers too and I wouldn't normally pick a book with a cover that doesn't appeal to me, but this one.. it was just too intriguing to pass it up :) Give it a try, I'm sure you'll find it interesting! I was a real big fan of 50 cents music when he first came out, but now I think my music taste has changed dramatically. Thanks for the giveaway! I don't listen to 50 cent's music, but I'd really love to give his writing a try. Honestly, I wouldn't say that I'm a fan of 50 Cent's music, and I definitely don't think that I would have picked up his book without having read your review. The story sounds super interesting and I'm definitely putting this book on my to-read list! I actually have not listed to a lot of 50 Cent's music, but writing lyrics is writing, so writing a book does not seem so surprising. My boys (13, 14) and I recently read Part-Time Indian, so if it's anything like that, we're in! Thanks for the giveaway, this sounds like a great book. And thanks for making it international. To be honest, I'm not too familiar with his music but apparently he's really good (according to friends). I'm interested to see what he's got to write about! Oh wow. I admit that I too kinda scoffed when I heard about this book, because celebrities in general writing books makes me scoff. Which, is I know, rude and judgemental, but... Still. But I'm actually kinda thrilled that you seemed to love this one so much! How amazing is it that a book that you didn't expect to really love it one that you connect to so strongly. It sounds great! I was like you- definitely skeptical about 50 cent writing a book, and highly doubting it would be any good! But after your review I'm definitely intrigued! I haven't heard of this one, but it sounds great! Thanks for the giveaway!! I'm so curious about this one- I probably would have read it because I want to know if 50 Cent can write. (I know he's a rapper, but I don't know what else.) Anyway, I'm glad it's good. I love when a book surprises you like that! Lol I forgot to add that I've probably a heard a song by him since I live somewhere where rap and that kind of music is really popular but I don't know for sure, so I'm not sure. Wow! I didn't know he wrote. I do like some of his music and I'd definitely be interesting in how he'd write! I wont lie, I do like a couple of his songs, but my husband is definitely a fan. 50 cent writing Young Adult AND blurbed by Rusell Simmons = MUST READ! I wasn't sure of a book written by 50 cent, but I will have to give it a try for sure Thanks. I think I only know one song by 50 cent. xD He is not my type of rapper. Fantastic review. I don't really listen to 50 cent...not a rap listener. HA even I was like WHAT?? when I heard that 50 cent had written a book. Ah, well. I'll need to see if it's good ;) Great review and thanks for the giveaway! I used to really like his music. I, too, was surprised when I found out about the book, but it seems really good. I have it on my TBR list. Wow! I thought 50 Cent was just a part of the title. Not a book of 50 Cent himself. The story of the book came out from his experience, maybe that's why it's a good one. He can relate his story to people. I never thought that I would be interested in reading this book. I am not a fan of 50 Cent's music. Not just his, to be fair. I am not into rap music at all. When I heard that he wrote this, I was pretty sure it would never be read by me. I can't say that I would buy this, but if I run across it at the library, I might just have to see what it is all about for myself. And just to be clear, I have nothing at all against him. Just not a fan of that kind of music.